I love to go on vacation (who doesn’t?)! You get to meet new people, see sights you have never seen before, and may never again. When my husband and I went on vacations before kids, I could tell you of some awesome stories of when we couldn’t find a hotel and drove till 4 AM, or how my kids were amazed at how much of the Chicago skyline you could see from Willis Tower. The one thing we never skip when we go on vacation is God. He is always there for us, and never takes a vacation from his work in us, so why should we take a vacation from Him? As Catholics, it is awesome that no matter where in the world we go, our Mass is always the same. I feel like the best part of our adventures going to see the huge Cathedrals or attend Mass in a tiny Church on the plains. I love the beauty of the stain glass windows or the relics they may be hiding. This is why when I received 101 Places to Pray Before You Die, A Roamin’ Catholic’s Guide, by Thomas J. Craughwell, I couldn’t wait to see what places I’ve already visited and new ones to go to on our next adventure. Craughwell’s book offers the “roamin’ Catholic” a variety of locations to visit in the United States, from large Basilicas and Cathedrals to quiet retreats or places of interest. Of course, I started with my home state, Nebraska, and was delighted to see his stop for Nebraska was Boys and Girls Town founded by Father (future recognized saint) Flanagan. Here you can visit the museum and learn about how Fr. Flanagan saved the lost boys of Omaha and eventually worldwide, visit his home, pray in the flower gardens or even attend Mass at their on campus Church (recently renovated) where Fr. Flanagan lies. Then there were other stops he also had on my checked list, Our Lady of the Snows Belleville, IL (near St. Louis), St. John Cantius in Chicago, IL, and so many more on my “bucket” list. Our Catholic Church is so amazing and wonderful, and each Holy site holds its own treasure for faithful worship to quiet reflection. This book covers all of the states, where he lists a few sites in each location, but it is such a small list compared to all of the possible places of adventure. This is a great start for someone who would like to know more about our Catholic faith, as he also describes why he picked the place and a brief history to wet your appetite. Even if you aren’t able to visit all of these Holy locations, it is great to be able to recommend places to visit to family or friends, or to let a distant friend know about a place they may not have known about right where they live. (They say many people don’t even visit the sites in the place where they live!). I do wish there were pictures in the book of these places Craughwell is suggesting we visit, but thank goodness for Google to show us any place we want to go. 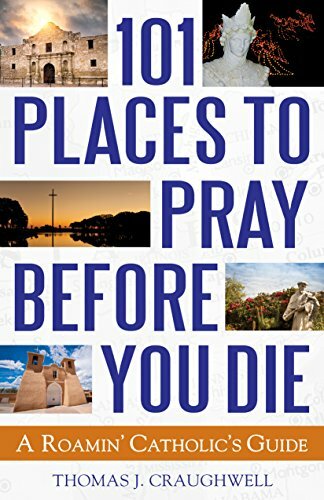 Pick up a copy of 101 Places to Pray Before You Die, A Roamin’ Catholic’s Guide, by Thomas J. Craughwell before your next vacation, check out some great sites in the state where you’ll be visiting and I promise your vacation will be blessed! Five million visitors crowd into St. Patrick’s Cathedral in New York each year. Hundreds of thousands annually pay homage to the Blessed Virgin at the National Shrine of the Immaculate Conception in Washington, D.C. But Catholic travelers don’t always realize that every state in the Union contains unique shrines, retreat houses, missions and other significant holy places. In 101 Places to Pray Before You Die, you’ll discover the unexpected, the somber, the whimsical and the inspiring spots that, at times, are hidden in plain sight. Every American has heard of the Battle of the Alamo, the heroic-but-hopeless defense put up by a few dozen Texans against an army from Mexico that numbered in the thousands. But most visitors overlook the fact that the Alamo was actually founded by a Franciscan priest as a mission, to bring the local Native American tribe into the Catholic faith. A drive through Cullman, Alabama, will lead you to four acres of quirky miniature reproductions depicting some of the world’s most famous religious structures. Nuns who nursed the wounded on both sides of the Civil War are honored at Washington, D.C.’s Nuns of the Battlefield monument. Dorothy Day, the social activist and champion of the poor, left her mark across New York City—and you can follow in her footsteps. The book also bears witness to the legacy of European, Latin, African and Asian immigrants and Native Americans, tracing their distinctive influence on the history and practice of Catholicism in America. Conveniently organized by state, 101 Places to Pray Before You Die will enhance your travel experiences—whether it’s a day trip to explore a spot you’ve breezed past a hundred times, a quick detour on a business trip or a family vacation dedicated to more intensive spiritual searching. Each entry contains details about the location’s significance to American Catholics, along with the address, contact information and hours of operation. Book Review, Catholic Upgrade, Faith. Bookmark.